May 8th, 2016 | Posted by Velda in ACUPRES.,MERIDIANS, REFLEX. Stimulating the following six acupressure points with your fingers have one thing in common. They can bring relief to constipation, relax the abdomen and help in relieving the associated symptoms of constipation such as abdominal pain, bloating and gas. We have included all six acupressure points for review, because they each treat other miscellaneous disorders. 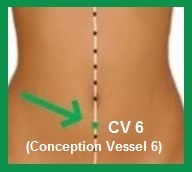 CV6 or Conception Vessel 6 is an important acupressure point for treating constipation. 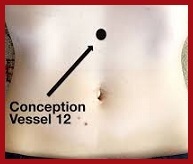 It is located two finger widths below the center of your belly button. This point should be stimulated using the fingertips gradually. The pressing should be no more than 1 inch deep. Maintain pressure for 30 seconds, breath normally, and keep eyes closed. CV6 point helps in relieving pain in the abdomen, constipation, colitis and gas. It is also useful for treating hernia, irregular menstruation, digestive disorders and fatigue. CV12 or Conception Vessel 12 relieves constipation along with abdominal spasms, stomach pain, indigestion, heartburn and emotional stress. It is also an effective pressure point for dysentery, jaundice, insomnia and vomiting. It is known as the Center of Power and it can be found on the midline of the body, halfway between the base of the breastbone and the belly button. This point should be stimulated with great care and should not be pressed for more than 2 minutes at a stretch. It should be pressed on an almost empty stomach. Avoid CV12 if you are suffering from heart disease, cancer or hypertension. 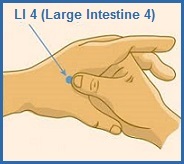 LI4 or Large Intestine 4 is by the most famous acupressure point for various health issues including constipation relief. It is located on the fleshy muscle between the index finger and the thumb. Spread your thumb and in index finger apart and stimulate this point by squeezing the fleshy webbing with your fingertips for 1 minute while you take long, deep breaths. Now. Remember acupressure both hands. LI4 helps to relieve chronic pain, eye problems, toothaches, allergies and boosts the immune system. This point is forbidden for pregnant women. Stimulating this point can lead to premature contractions of the uterus. St36 or Stomach 36 is a beneficial point of acupressure for constipation that relieves stomach and intestinal disorders, promotes digestion and strengthens the whole body. This is also known as the Three Mile Point and it is situated four finger widths below the kneecap, one finger width towards the outside of the shinbone. When you reach the correct spot, you will feel flexing of a muscle as you move your foot up and down. Use your palms to briskly rub this point for one minute on both legs. St36 is also a useful point for asthma, PMS, insomnia, depression and nervousness. 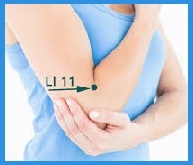 LI11 or Large Intestine 11 is a functional acupressure point that provides quick cure for constipation. This point is also called the Crooked pond and it is situated at the outer end of the elbow crease. Press this point firmly using your fingers for 1 minute as your breathe deeply. Switch hands and stimulate the point on the other arm as well. This is an effective point to relieve indigestion and constipation. This is a vital trigger point for the colon. LI11 aids to reduce high fever, skin diseases, diarrhea and heat stroke. It is also a local point for elbow pain and tennis elbow. 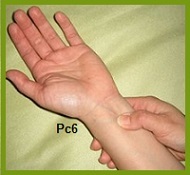 PC6 or Pericardium 6 is an effective acupressure point that is located on the medial aspect of the hand, approximately three finger widths below the wrist, in the hollow between the tendons. This point is also called the Inner Gate point and it should be stimulated by pressing the point with your fingertips. Apply pressure on the point for 1 minute and then switch side and apply pressure on the other arm. In addition, LI11 is used to treat upset stomach, motion sickness, headache, nausea, carpal tunnel syndrome, asthma, and angina and chest tightness.